Dan was raised in Italy and traveled frequently throughout western Europe. As an adult he spent time in both Africa and Sri Lanka recording music and sound effects for use in later projects. World music continues to exert a strong influence in his writing. As a performer, he toured for several years around the northwest with The Portis-Cathers Ensemble, a trio incorporating guitar, violin (Dave Burham and Rob Thomas) and tabla/percussion (Roger Hadley). After a long hiatus, he is resurrecting this group and looks forward to playing their original music once again - a blend of classical, jazz and world music styles which Joseph Roe from OPB once called "one of the truly great new music ensembles in the Northwest." 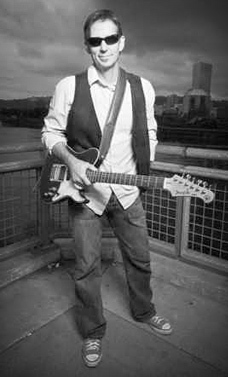 During the late 90's and early 2000's Dan moved to Nashville to study songwriting and song production. His passions are writing and producing - which often must go hand in hand. A highlight of his work is collaborating with instrumentalists from around the country whenever possible.